We list all the different weapon types, proficiencies, modal abilities, bonuses, and penalties in Pillars of Eternity 2: Deadfire. One of the more obvious choices players need to make in Pillars of Eternity 2: Deadfire concerns their hero's preferred weapons. Obsidian Entertainment's latest RPG has a lot of different weapons on offer, and choosing proficiencies with certain weapons means deciding between a number of different active and passive skill bonuses and penalties. Beyond that, weapon proficiencies are also tied into the game's potent Modal Abilities. 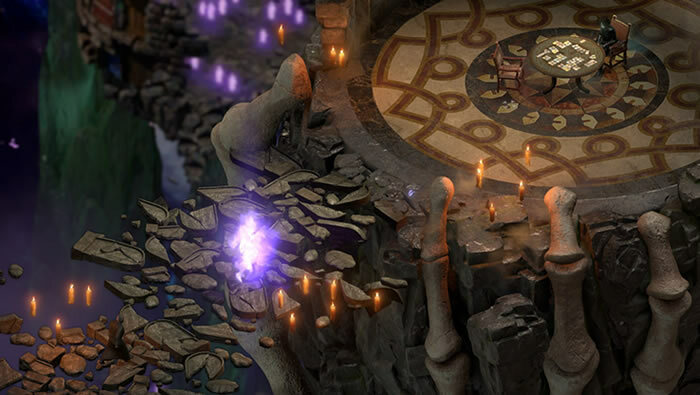 Read on to learn more about all the buffs, bonuses, penalties, and abilities surrounding Pillars of Eternity 2: Deadfire's many different weapons. 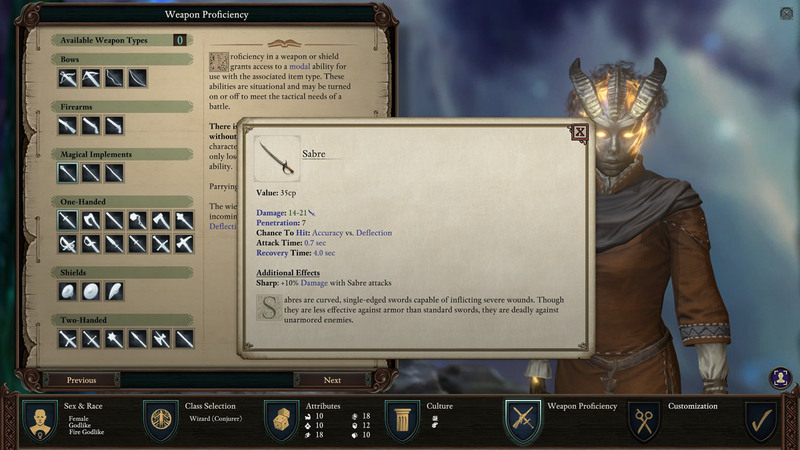 The choice of which weapon to use during Pillars of Eternity 2: Deadfire's character creation process really comes down to player preference. Five different types of weapons are available: bows, firearms, magical implements, one-handed, and two-handed, in addition to the availability of defensive shields. Each weapon type comes with its own base attributes for damage, penetration, range, attack time, and reload time, as well as potential bonuses to hero attributes. Weapons also grant access to specific modal abilities, the likes of which can be utilized at will. Each different weapon has a different Modal Ability, but players will only be able to take advantage of them for the two weapons they choose to be proficient with. Heroes won't incur any penalties for using weapons they aren't proficient with — they simply won't have access to the weapon's specific Modal Ability. 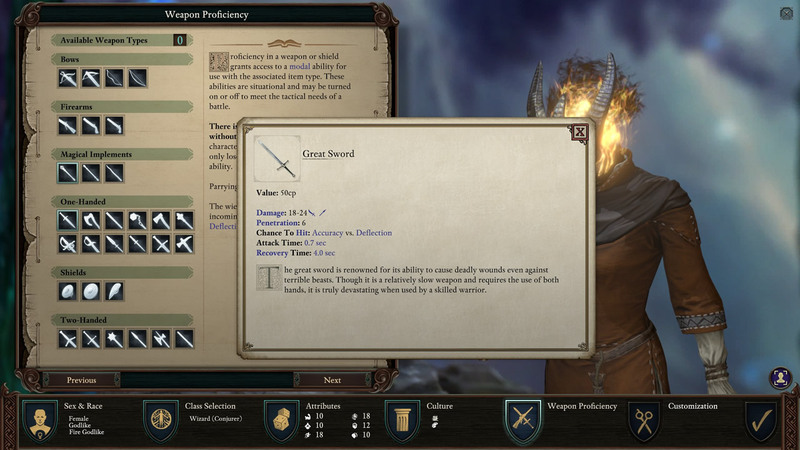 By and large, players going after ranged weaponry in Pillars of Eternity 2: Deadfire can expect decent range and penetration power at the cost of reduced Crit damage and deflection, with some weapons providing a distinct bonus or penalty to Accuracy. Modal Ability: Overbearing Shot - The character takes careful aim to cause maximum impact with the Arbalest. Hits knock the target prone. Modal Ability: Interrupting Shot - The character takes careful aim to cause maximum impact with the Crossbow. Hits Interrupt targets. Modal Ability: Rapid Shot - The Hunting Bow allows for rapid draw and fire of arrows at the cost of accuracy. Modal Ability: Overdraw - With slower heavier draws, the War Bow can penetrate the toughest armor. Modal Ability: Aimed Shot - The Arquebus wielder takes time to line up a well-aimed shot. These attacks are far more Accurate. Modal Ability: Powder Burns - Overloading shots with powder causes a short range incendiary, but the thick smoke from the blunderbuss is distracting to the wielder. Modal Ability: Rapid Shot - The character fires and reloads the pistol quickly, at the cost of accuracy. Pillars of Eternity 2: Deadfire's one-handed weapons are solid all-rounders, giving players offensive options often without any sort of skill bonus or penalty while simultaneously offering some of the most useful Modal Abilities. Modal Ability: Destructive Channeling - Channeling excess energy through the scepter hurts the wielder with each attack, but increases the damage dealt. Modal Ability: Blast - The rod attacks with greater energy, slowing the wielder's recovery, but hitting enemies around the target. Modal Ability: Interfering Barrage - Focus wand attacks to interfere with the enemies' ability to attack effectively, at the cost of damage. Modal Ability: Parrying Blade - The wielder focuses on deflecting incoming attacks, trading damage for Deflection against melee weapons. Modal Ability: Bleeding Cut - The Axe wielder takes brutal swings to dig deep into the target. The attacks are slower, but cause bleeding wounds on hit. Modal Ability: Bewildering Blows - Aims to concuss the target by striking them in the head to lower their Will defense. These attacks deal less damage. Modal Ability: Unbalancing Strikes - Focus your attacks on your target's footing, dealing less damage, but lowering Reflex on hit. Modal Ability: Interfering Strikes - Hook and slash wildly with your attacks, interfering with your enemies' ability to focus their aim, at the cost of damage. Modal Ability: Rending Smash - The character swings the mace with massive force, damaging the target's armor at the cost of Recovery Time. Modal Ability: Needle Strike - Carefully strike with your rapier, aiming for vital points to ensure success. Fighting this way increases Accuracy at the cost of Recovery. Modal Ability: Windmill Slash - By swinging the sabre with great arcing strikes, gain Penetration at the cost of Recovery Time. Modal Ability: Engaging Thrust - Fight defensively with your spear, allowing you to engage an additional foe at the cost of Stride. Modal Ability: Piercing Thrust - Carefully aim for weaknesses in enemy armor, trading Recovery Time for increased Penetration. Modal Ability: Half-Sword - Fight in a close quarters style, using your blade to penetrate armor more effectively at the cost of a lower Deflection. Modal Ability: Piercing Blows - Strike with heavy piercing attacks gains additional Penetration at the cost of Recovery Time. Players looking for shield proficiency in Pillars of Eternity 2: Deadfire will find they can engage more enemies with than without. On the flip side, those who opt for two-handed weapon proficiency won't find much in the way of passive skill buffs, but will enjoy one of various potent modal abilities. Modal Ability: Binding Block - Use your small shield to better intercept melee weapon attacks and counter at the cost of Recovery Time. When missed by melee weapons, gain an increased Accuracy on your next weapon attack. Modal Ability: Block - Use your shield to attempt to block incoming weapon attacks, completely resisting the attack (if successful) at the cost of Recovery Time. Modal Ability: The Wall - Taking careful position behind the large shield significantly reduces incoming ranged weapon damage as well as damage from attacks that target Reflex. While active you are unable to move. Modal Ability: Vulnerable Thrust - Leave yourself vulnerable to make powerful driving attacks with your estoc, gaining Penetration at the cost of Deflection. Modal Ability: Savage Attack - The character swings their Greatsword with massive force, increasing damage at the cost of accuracy. Modal Ability: Body Blows - Direct your strikes towards the body, dealing less damage, but lowering the target's Fortitude. Modal Ability: Exposing Strikes - Use the pike's reach to set your opponents off guard, exposing their weak points to your allies at the cost of reduced damage. Modal Ability: Defensive Strike - Weave the quarterstaff to deflect incoming blows, gaining increased Deflection against melee weapons at the cost of Recovery Time. Learn more about the many interrelated systems and mechanics in Obsidian's latest release by heading over to our Pillars of Eternity 2: Deadfire walkthrough and guide hub, where we break down everything from classes and races to ship combat, companions, and more.